US Amazon has begun marketing a special Kindle bundle aimed at kids that includes 2-year accidental damage cover. No mention of this yet on the UK site. Includes the latest Kindle without sponsored screensavers ($99.00), a kid-friendly cover ($19.99), and a 2-year warranty provided by SquareTrade ($19.99). Save $39.98 compared to when purchased separately. -Drops or spills? No worries – includes 2 years of accident protection provided by SquareTrade. Once your Kindle ships, you will receive an email with instructions on how to activate your coverage. 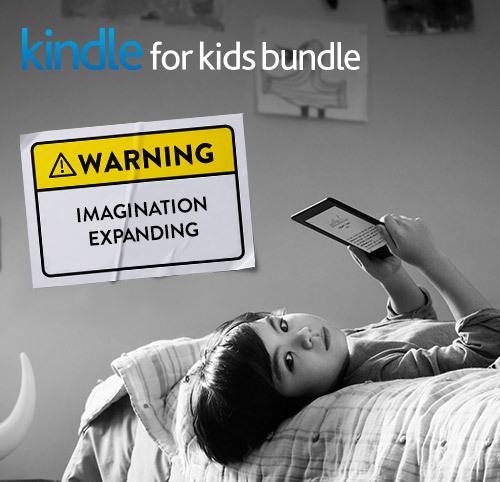 via Kindle for Kids Bundle – Amazon’s Official Site – Learn More. Booktrust announced yesterday that Amazon Kindle will no longer be sponsoring its Best Book Awards, controversially launched last year, when Allan Ahlberg declined to participate, in protest at Amazon’s involvement. At the same time it announced that there will be no Best Book Award this year – the next one will be in 2016 (by which time an alternative sponsor will have been appointed) and the Award will thenceforth be a biannual event. ACHUKA rather regrets this development. I was present at last year’s inaugural presentation and Amazon Kindle’s promotional presence was unobtrusive. In fact it was good to see a partnership between new and traditional forms of reading. The president of the UK Booksellers Association, Tim Walker spoke at the Nielsen BookInsights conference yesterday and made some startling revelations. via Amazon Controls 95% of the eBook Market in the UK. The rise of these electronic devices built only for reading has been a boon to the books sector. The transition to digital reading brought with it a new kind of publishing that was distinctly more experimental, energetic and (nakedly) commercial than that which preceded it. Just this week the publisher Little, Brown began publishing ebook shorts based on the hugely successful Broadchurch TV series that are made available to download in the hours after each show. Outside of traditional publishing, digital reading has allowed authors to publish directly to marketplaces run by Amazon, Nook and Kobo. We have also seen the rise of fan-fiction sites (one of which helped create Fifty Shades) and writer development sites such as Wattpad and Movellas. There is a vibrancy and quickness around publishing that can be directly linked to the arrival of the ebook. It has helped revive the print book market, with titles such as The Miniaturist and H is for Hawk published as beautifully rendered physical editions to be held, read and kept. The better publishers understand the boundaries of these different channels, the better they have become at delivering content to them. via Long live the ebook – it’s a champion of the printed word | Philip Jones | Comment is free | The Guardian. According to a new report from the United Kingdom, 50% of readers tend to use their mobile phones [for reading] books. This research is quite telling because e-reader and tablet sales are quite robust and have a high rate of availability in the retail sector. Overall, 50% of UK mobile reading consumers used the Amazon Kindle app to read on their mobiles, followed by Apple iBooks with 31%. Reading platforms Kobo and Nook are in third and fourth places with 9% and 6% respectively. Among younger readers, iBooks is closing ground on Kindle. The study found that 41% of 18 – 24 year olds who use their mobile to read are using Kindle, versus 39% who are now using iBooks. via e-Reading on Mobile Phones is on the Rise. Amazon announced KDP Kids yesterday. It’s a new tool designed to help children’s book authors prepare, publish and promote both illustrated and chapter books in Kindle Stores. Children’s authors can use Amazon’s new Kindle Kids’ Book Creator tool to create illustrated children’s books that take advantage of Kindle features like text pop-ups. The Bookseller repports that Allan Ahlberg has declined the Booktrust Best Book Awards Lifetime Achievement Award because it is sponsored by Amazon. He has said that having the Amazon tag attached to a lifetime achievment award maked it impossible for him to accept. Ahlberg, 76, who has written more than 150 children’s books in a career spanning nearly four decades, explained that he felt compelled to take the stand on ethical grounds following widespread reports of Amazon’s tax avoidance in the UK. Ahlberg said Booktrust’s reputation had been tarnished by partnering with Amazon. “For my part, the idea that my ‘lifetime achievement’.. . should have the Amazon tag attached to it is unacceptable,” he said. via Amazon-backed award turned down by Ahlberg | The Bookseller. “I love my gadgets – I used to be a programmer! – but I think we’re always going to need stories,” said Blackman, during an appearance at the Children’s Media Conference in Sheffield. Blackman cited the importance of “reading with meaning” – children not just reading a story, but understanding it – and questioned whether some book-apps with “all the bells and whistles” further that aim, if children are distracted from the story itself. “I do think it has to be carefully handled how you do that, but we’ll have more reading going on on electronic devices. That’s inevitable,” said Blackman, before citing a study suggesting that 17% of teenagers are embarrassed to be seen reading by their peers – with e-reading a possible solution to that. Blackman is curating a Young Adult Literature Convention (YALC) as part of the London Film and Comic Con convention this month, in a deliberate effort to position books alongside other cultural forms that appeal to young people. “For me it’s about embracing stories. If you’re into films and into TV and into computer games there’s absolutely no reason why you couldn’t be into books as well,” she said, before suggesting that no child should be lost to reading. via Malorie Blackman: ‘I love gadgets, but e-reading has to be carefully handled’ | Books | theguardian.com. 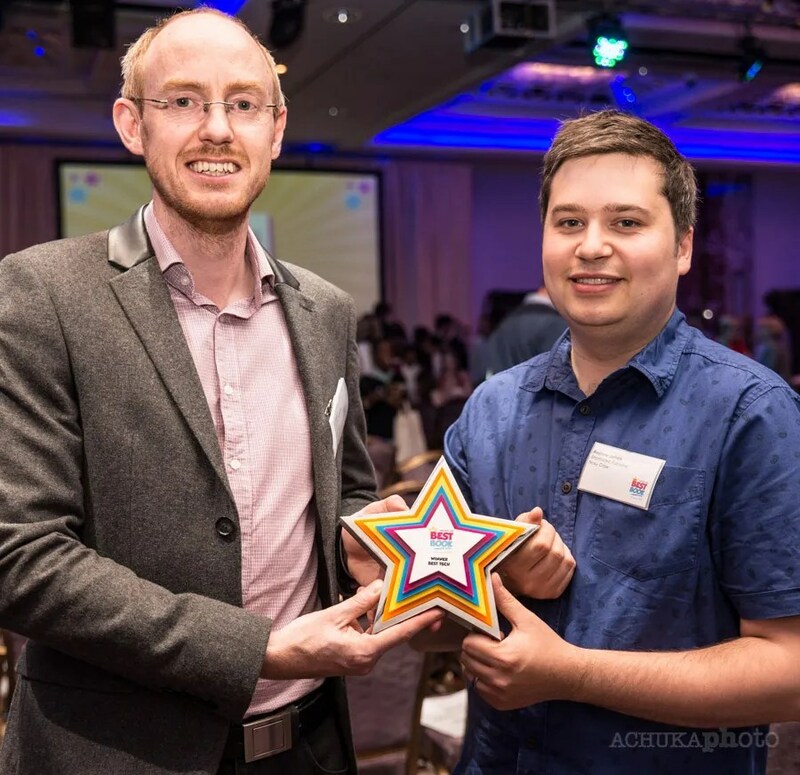 Will Bryan, Nosy Crow’s Head of Apps Development: Engineering and Andrew James, Nosy Crow’s Senior Technical Artist holding their Best Book Award 2014 for “tech stuff’, for their production on Axel Scheffler’s Flip Flap Farm. I was delighted to be invited along to yesterday’s presentation of these awards at a hotel venue in central London (see yesterday’s post for a full list of winners and shortlisted titles). It was an impressive ‘bash’ with several hundred school children and students attending and a host of authors and illustrators (not just shortlisted ones) milling around both before and after the formal presentations. The new awards are jointly organised and sponsored by Booktrust and Amazon Kindle. I trust the lavish conference-style catering yesterday was largely courtesy of Kindle. Other than running their short Kindle ad (the rather good one with children enthusing about reading books on their Kindles) midway through the proceedings, the Kindle connection was not pushed to any great degree. “Expert judging panels” selected four titles for each category shortlist and these were then read and voted on by ‘thousands’ of children. Some of the outcomes were easy to predict. How could Jeff Kinney not have won the popular vote in the 9-11 category, or John Green not come out top in the 12-14 section. But other sections of the awards were more difficult to call. Philip Reeve and Sarah McIntyre could realistically have hoped for good news when the announcement of the 6-8 section winner was made. The winner, though, was Stephen Pastis, for Timmy Failure: Mistakes Were Made. Pastis is an American cartoonist as well as children’s chapter book creator and so, like Kinney (also American), was unable to accept his award in person. John Green might have been expected to attend but was ‘on holiday’ and it was left to Shannon Cullen, his editor at Puffin, to receive the award on his behalf. In the end, just two of the six category winners graced the stage in person to receive their awards: Lucy Cousins for Peck Peck Peck in the 0-5 category and the two Nosy Crow guys pictured. Mel Giedroyc did her best to make light of this but it did detract just a bit from an otherwise hugely successful and enjoyable awards presentation, which was ‘live streamed’ out to schools. She was also brave enough to have a little tease about Michael Morpurgo’s trademark ‘pink’ trousers “They’re very gangsta, Michael, those trousers”*, as he left the stage at the end of his opening talk [click link for streaming audio – recommended listen].